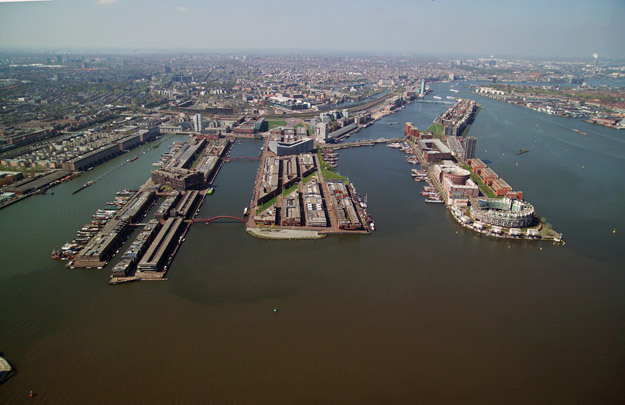 The harbour basins of Amsterdam's eastern docklands were dug at the end of the 19th century to replace the docks that had become too small and even inaccessible once the railway had been constructed between them and the city. In the 1960s these docks themselves fell into disuse with the arrival of container transport and given the increasing size of ships. When it was decided in the 1980s to prime the area to receive housing the first proposal was to fill in the harbour basins. Ultimately, it was elected to retain the unique combination here of land and water and transform the piers into tranquil residential enclaves. The first of these to arrive was at the Entrepot site masterplanned by Atelier Pro. A stand-out feature here is that firm's own housing block, winding its way across the water. Occupying the former cattle market and slaughterhouse site is a mixed-use business zone and an estate of some 600 social housing units. Once it had been decided to develop KNSM-eiland along the lines of the former quayside development, Jo Coenen produced a formal urban plan of big beefy apartment buildings by Hans Kollhoff and Bruno Albert that conform to the scale of the harbour basins. Certain existing buildings earmarked for retention have been woven into the structure of these huge blocks. Coenen himself designed the housing on the pier head. For the peninsulas of Borneo and Sporenburg, West 8 Landscape Architects devised a low-rise scheme packing 100 houses per hectare into long three-storey rows on narrow plots. The sea of low-rise is interrupted by a trio of large apartment buildings (including The Whale) which bridge the gap between the low-rise and the great scale of the docklands. Private commissions from individual architects inform the compact sequence of residences in Scheepstimmermanstraat. The sheer size and formal urbanism of nearby KNSM-eiland is set off on Java-eiland by Sjoerd Soeters' small-scale variegated urban structure interspersed with canals set breadthways. The reason for having more than one architect work on a single block is to try to attain the variety found in central Amsterdam's canal frontages.